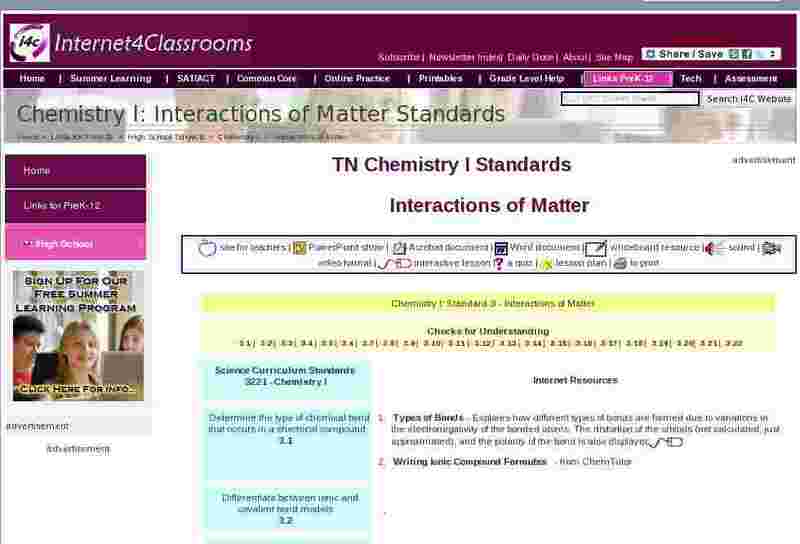 Determine the type of chemical bond that occurs in a chemical compound. Differentiate between ionic and covalent bond models. Identify the chemical formulas of common chemical compounds. Employ a table of polyvalent cations and polyatomic ions to name and describe the chemical formula of ionic compounds. Convert percent composition information into the empirical or molecular formula of a compound. Apply information about the molar mass, number of moles, and molar volume to the number of particles of the substance. Balance an equation for a chemical reaction. Chembalancer - a little online game to teach balancing equations - You type numbers in front of each molecule until there are the same number of atoms on both sides of the equation, then click the 'Balanced' button. Classify a chemical reaction as composition, decomposition, single replacement, double replacement, and combustion. Use activity series or solubility product table information to predict the products of a chemical reaction. Predict the products of a neutralization reaction involving inorganic acids and bases. Interpret a chemical equation to determine molar ratios. Convert between the following quantities of a substance: mass, number of moles, number of particles, and molar volume at STP. Solve different types of stoichiometry problems (e.g., volume at STP to mass, moles to mass, molarity). Determine the amount of expected product in an experiment and calculate percent yield. Calculate the amount of heat lost or gained by a substance based on its mass, change in temperature, and specific heat during physical and chemical processes. Research applications of thermal changes in nuclear reactions. Identify a substance as an acid or base according to its formula. Investigate the acidity/basicity of substances with various indicators. Write the nuclear equation involving alpha or beta particles based on the mass number of the parent isotope and complete symbols for alpha or beta emissions. Determine the half-life of an isotope by examining a graph or with an appropriate equation. Write a balanced nuclear equation to compare nuclear fusion and fission. Describe the benefits and hazards of nuclear energy. Analyze ionic and covalent compounds in terms of how they form, names, chemical formulas, percent composition, and molar masses. Identify the reactants, products, and types of different chemical reactions: composition, decomposition, double replacement, single replacement, combustion. Predict the products of a chemical reaction. Balance a chemical equation to determine molar ratios. Convert among the following quantities of a substance: mass, number of moles, number of particles, molar volume at STP. Identify and solve stoichiometry problems: volume at STP to mass, moles to mass, and molarity. Classify substances as acids or bases based on their formulas and how they react with various indicators. Describe radioactive decay through a balanced nuclear equation and through an analysis of the half-life concept. Compare and contrast nuclear fission and fusion. Relate the laws of conservation of mass/energy to thermal changes that occur during physical, chemical or nuclear processes.